Basketball talent observers wanting to catch a glimpse of Robert Bobroczky will have to wait – most likely until next season because Stellazzurra Basketball Academy Rome is sitting out the 15-year-old prospect all year so he can work on his body. Bobroczky’s body is the first thing that fascinates those who see him. The Romanian is string-bean thin and giraffe-like tall as he towers over his young teammates and opponents at 2.29m (7-foot-6). But for those who have seen him live – or even on video – watching him on the court go up and down the floor makes you quiver, hoping he doesn’t break. Besides his rail-thin frame, Bobroczky also runs quite awkwardly and tires easily. And those are reasons enough that Giacomo Rossi and the staff at Stellazzurra are keeping him away from the court – and close to the dining room. Robert Bobroczky towers over his teammates in every way on the court. Oh, there’s basketball skills aplenty in Bobroczky. But those will have to wait. “For this year we decided to concentrate everything on the development of his body – to put kilos on his body, give him a lot of physical therapy. He needs to improve his body,” said Rossi, the sports director at Stellazzurra. 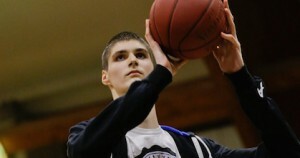 Robert Bobroczky is much more than a very, very tall basketball player. Stellazzurra had the United States National Institute of Health in Bethesda, Maryland create a nutrition plan for Bobroczky, calling on him to eat seven times a day including more than two pounds of pasta. An Associated Press report in mid December 2015 listed Bobroczky at 184 pounds (83.5 kilos). His daily schedule also includes two hours of physical therapy, including stretching, co-ordination and posture exercises; as well as two hours of muscle strengthening. Rossi also said his staff is working the youngster’s mind. “He’s a very good person. He’s a genius in school, a very smart person. But he’s lazy. We need to accelerate his mind,” said Rossi. But what about Bobroczky’s game? “He’s a real basketball player. He can shoot, he has amazing touch. He can shoot 90 percent from the free throw line and 50 percent of his three-pointers. He can pass very well, he reads the game,” says Rossi in an excited tone about Bobroczky – the son of a 2.17m tall father. But again, he comes back to the Bobroczky’s body. “This is why we say basketball will arrive later. We want to fix the body because if we can fix the body, he could become amazing basketball player,” he says.